A lot of people ask me why I belong to a CSA and I can’t say that I have any one standard response. I want to buy as much food as I can from within 100 miles of my home. I want to know my farmer, which I believe allows me to know more about exactly what’s going into my family’s diet. I want to eat organically. 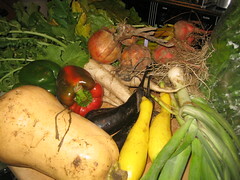 Maple Creek Farm is my CSA, run by Danny and Michelle Lutz. We like to joke with them that being farm members is a lot like vegetable lotto, only we’re always winners. Our latest shipment from Maple Creek includes beets with greens, arugula, leeks, onions, daikon radishes, bell peppers, eggplant, yellow summer squash, and butternut squash. I think we might be try to make a roasted beet and arugula salad for dinner this Friday. The onions go into storage as usual, with the green peppers being the big issue this week. We still haven’t used all of ours from last week and this weekend, The Big Guy’s brother gave us a few more. I think we’re up to the drying stage in the food dehydrator. The squash and eggplant and even the leek will be stir fried, I’m sure. The daikon…hmm…I don’t honestly know. I think I need to go looking for recipes there. I wonder if we can use the greens? 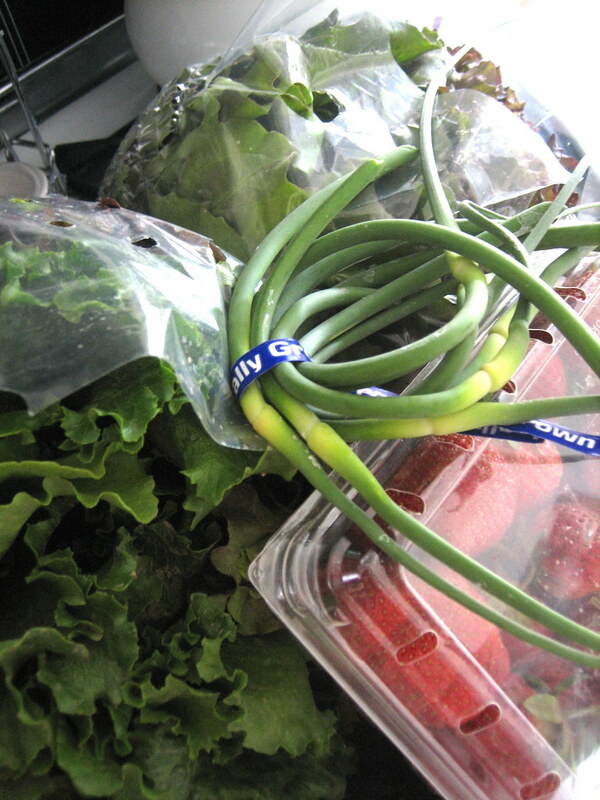 Included in this latest shipment from Maple Creek Farm are Brussels sprouts, green zucchini, Delicata squash, yellow cippolini onions, apples, bell peppers, basil, arugula and swiss chard. Originally there was also celery in this shipment but I swapped it out with the arugula extra that someone had placed in the swap basket. There were also some hot peppers in the basket for the taking, but I had already used them in the dinner meal by the time this photo was taken. Right now I’m struggling with what to do with all the squash. I do not think we can eat it all this week (more is buried under the produce in this picture), and I have to weigh the idea of putting some in the freezer cooked or seeing if the squash will actually keep for a while. Farmer Michelle says this variety is a bit short lived compared to others and has recommended we eat it within the month, so I suspect we’ll cook it and freeze it despite the premium on freezer space. The same will be said for all of the arugula and the basil, though this will be made into pesto. I think the chard is going to be made into a tart, but I’m toying with the idea of making a variation of the really yummy Butternut Squash Pilaf I made a while back. This one might prove a bit more difficult, though, because delicatas are decidedly softer in texture. Hmm. More decisions. 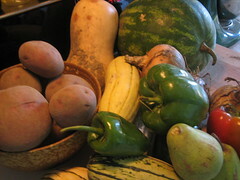 This week’s produce from Maple Creek is a little smaller and includes potatoes, butternut squash, watermelon, yellow onions, sweet dumpling squash, bell peppers, poblano peppers, and fresh pears. I finally got the camera back from The Big Guy. 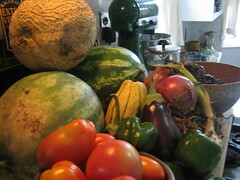 This past week’s produce contained melon, bell peppers (purple, red, and green), eggplant, basil, Russian red kale, raspberries, Spanish black radishes, butternut squash, watermelon, red onions, and roma tomatoes. So far we’ve consumed the melon, the peppers, the eggplant, the berries, and the tomatoes. I’ve set the onions by, though we’ve used a few. And the kale and basil got put into the blender for another batch of pesto to be frozen and saved for winter. The watermelon I just didn’t get around to cutting up yet, darnit. I’m hoping to do that RSN, but we have another shipment…yikes! In two days! This is my latest shipment from Maple Creek Farm. 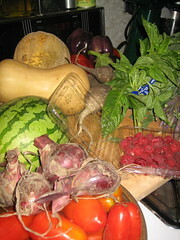 Cantaloupe, watermelon, squash, onions, green peppers, tomatoes, and green beans are all included. There were originally radishes with the shipment but someone had left a watermelon in the swap box so I traded the radishes and some of the green peppers for the extra fruit. I think I may make more Watermelon Pickle! 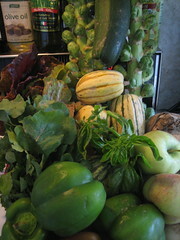 This week’s produce from Maple Creek Farm sees the start of melons and the heavier fruits and vegetables of fall. The cantaloupe is already half gone, with the other half going to The Big Guy’s mom for some of her lunches. We sent along some of the potatoes, purple beans, and green peppers from this week’s shipment too, so that she could maybe make some meals. Celery from the farm is always interesting, because it’s not the large, flesh stalks you can use to spread peanut butter on. It’s *fabulous* in soups and stuffings though, because the flavor is tremendous. Much rounder than store bought celery. 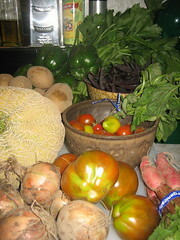 In addition to these items, we also got more cherry tomatoes, regular heirloom tomatoes, and onions. I’m trying to convince the big guy that he likes radishes and last night I included some of the ones we received in our dinner, slicing them ultra thin and including them in the stir fried vegetables that we put into wraps. This week’s challenge is probably going to be figuring out what to do with the basil. Maybe chopped fine and mixed with pasta that we include some other vegetables in? Ah, one never knows when I step in the kitchen. Enjoy! You are currently browsing entries tagged with maplecreek at More Than Just the Food.